'Small Works for a Large Universe' included the work of about 19 artists. An exhi­bi­tion of small art­works in our large project space as an exam­i­na­tion of the effects and sig­nif­i­cance of rel­a­tive scale on the mean­ing and pres­ence of the art­work and a reflec­tion upon our own place in a uni­verse so much larger than ourselves. There is a great selection of photos of the show on the Index website - CLICK HERE - as well as a video of the show by Ariel Riveros. 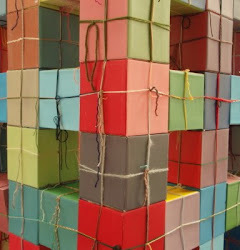 I exhibited a single painted cardboard cube strung up by wool from the rafters.